(York, Pa., Feb. 8, 2017) — The York Revolution revealed last night their first signings for the 2017 season, including the return of the greatest left-handed pitcher in club history and their All-Star third baseman. As announced by Revs manager Mark Mason on “Revs Hot Stove Weekly, presented by Shipley Energy” on SportsRadio 1350 WOYK, the Revolution have re-signed Chris Cody and Bryan Pounds and added outfielder Brandon Thomas as the first three signings for the upcoming campaign. Cody returns to York for the first time since the 2014 season. Selected to the Revs’ 10th Anniversary Team last winter and listed among the “Franchise Four” as one of the top four performers through the franchise’s first decade, Cody enters his fifth season with York ranking second in Revolution history in wins (39), starts (86), innings (513.2), and strikeouts (379), trailing only former teammate and fellow “Franchise Four” nominee Corey Thurman in each category. Cody won at least nine games in each of his three full seasons in York, including 10 victories in 2012 and a team-record 15 wins in 2013. Cody also set franchise records in innings (176.0) and strikeouts (139) during the 2013 season, leading the league in both categories, while his 3.12 ERA stands as the third lowest in a season in team history. Cody spent parts of the 2014 and 2015 seasons pitching in Taiwan and returns to York after spending the 2016 season rehabbing from injury. The 2017 season will be Cody’s 11th as a pro. The Brewster, NY, native was originally an eighth round draft pick of the Detroit Tigers in 2006 and ascended as high as the Triple-A level with the Milwaukee Brewers organization. The 33-year-old also pitched in the Atlanta Braves organization in 2011 after having his contract purchased from York. Cody is 82-67 with a 3.45 ERA over his professional career in the United States. Pounds was one of the league’s most clutch performers last season, notching a stunning eight last at-bat game-winning hits, a club record, for a Revs team that posted its third most victories in franchise history with 76. Overall, Pounds batted .331 with runners in scoring position and totaled 13 home runs, 26 doubles, and 69 RBI to go with a .250 overall mark at the plate. 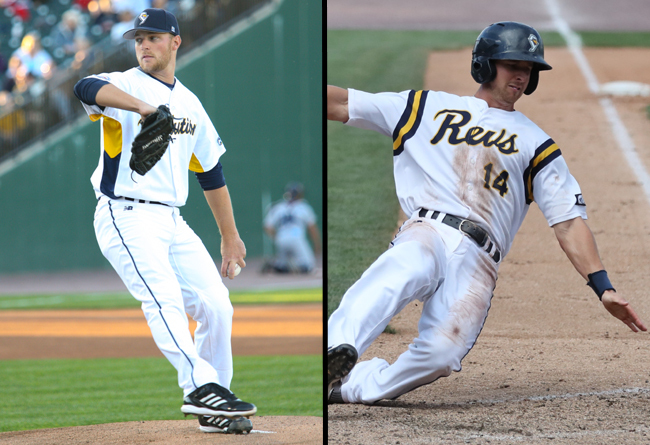 The third baseman was selected to the Atlantic League’s Red, White and Blue All-Defense Team at season’s end. The 2017 season will be Pounds’ third in York and fourth in the Atlantic League. He was an All-Star selection for Camden in 2014 and again for York in 2015. The Houston native began his career in the Detroit Tigers organization, where he spent his first five seasons, reaching Triple-A Toledo in 2011 and 2012. Thomas enters his first season in the Atlantic League in 2017. The 26-year-old was an eighth round draft pick of the New York Yankees out of Georgia Tech in 2013, spending his first three seasons in the Yankees farm system, where he totaled 140 hits, 12 home runs, and 39 steals. The Atlanta native played for Gateway of the Frontier League last season, belting 11 home runs with 42 RBI and 18 stolen bases in 19 attempts over 95 games played. The Revolution will continue to unveil preseason signings live each week on “Revs Hot Stove Weekly, presented by Shipley Energy”, with the next episode set to air on Monday, February 13, at 6:30 p.m. immediately following “The Baltimore Baseball Show” on SportsRadio 1350 WOYK.